Η ΕΙΚΟΝΟΓΡΑΜΜΑΤΗ και ΠΑΛΑΙΟΓΡΑΜΜΙΚΗ ΓΡΑΦΗ (από Μπουζάνη - Bouzanis K.): A Surgeon Urologist-Andrologist, Therapist from Ancient Egypt (1350 BC), the Advertisement and the Hieroglyphs! 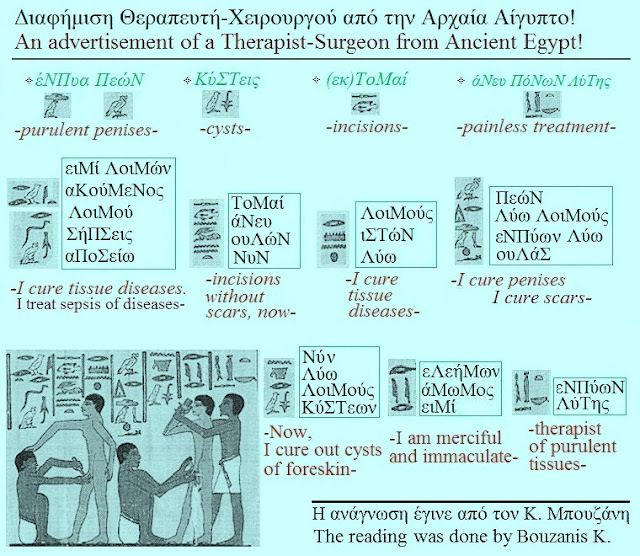 The Advertisement of a Surgeon Therapist from Ancient Egypt and the end of a failed venture! It is necessary, we must to reread the Hieroglyphs! And here, at Ancient Egypt, beats the heart of Hellenism! Here, the advertisement about the offer of services a Surgeon Healer enlists and the written word, beyond the picture, is addressed at laymen but at literate Egyptians! 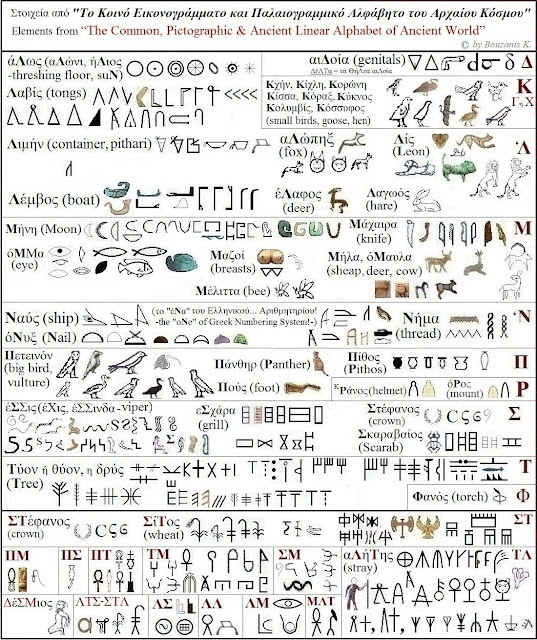 The local, Egyptian Idiom of Writing is formed from the Common, Eikonogrammati & Palaiogrammiki Writing of Sea Peoples of the Mediterranean and of around the Mediterranean, prehistoric World! * Mythical the birth of the People of Sea (the Hellen), after melting of glaciers of the above us Europe, the resulting congestion (deluge of Deucalion) and reformatting of the Mediterranean coast. He will serves to us the same... intelligence that, a century later, two other sages (... Englishmen! ), M. Ventris and J. Chadwick, deciphered(!) the Palaeogrammiki Scripture after the split in Linear b΄... it sat on them, and in Linear a΄... it did not make the grace them and stayed to wait, in vain, an wiser ... American! Αναρτήθηκε από Μπουζάνης Κων. - Bouzanis K. στις 11:11:00 π.μ.